The Daiso Detergent for Puff and Sponge is the stuff of legends. How can something so impossibly cheap work so impossibly well in getting your makeup sponges and brushes looking so clean and as good as new? How?? Well the answer really, is that its a detergent. One formulated for cleaning makeup sponges, but a detergent nonetheless. I’d heard a lot about it for ages, and back then, the only Daiso in town was at The Curve i.e. too far for me to get to. Thankfully for good friends, I got my hands on this iconic Daiso product. Now, I must say that this Daiso Sponge Cleaner is da bomb. It cleans makeup sponges and restores them to look as good as new. If you’ve ever fretted over your foundation sponges and wondered how to get the stains out of the sponge or puffs, this is your saviour. If you use it to wash brushes, even the filthiest of brushes cannot withstand the cleansing powder of this liquid detergent as I’ll show you below. It is THAT powerful! However, despite the many raves and recommendations to use this for cleaning makeup brushes, I personally do not recommend it for makeup brushes and I’ll tell you why. The primary reason I do not recommend it for brushes, is because the Daiso detergent is too harsh. I was using it to clean my brushes quite regularly – once a week or once a fortnight, and it was excellent. White brushes were pristine again and every brush looked clean and new. However, I also noticed that my natural hair brushes looked dry and felt dry and pokey. Most of my natural hair brushes are of the pricier variety so naturally I was concerned. So I stopped using this Daiso cleaner and went back to my trusted Johnson’s & Johnson’s baby shampoo. After a few washes, the brushes felt and looked normal again. Granted, the baby shampoo doesn’t get out colour very well from stained bristles but I’d rather not spoil my natural hair brushes. Synthetic brushes, being well… synthetic, don’t react to this cleaner. So if you use synthetic brushes then this Daiso Sponge Cleaner is a good one to have. It cleans out dense kabuki brushes like nothing else. Stains and liquid makeup cannot stand up to the cleaning power at all! Let me show you below. On the left is the MAC 239 brush that I especially like for applying eyeshadow (never thought you’d see “MAC” and “like” in the same sentence, did you? 😉 ) after using it with the Guerlain Les Aqua eyeshadow palette. The royal blue in that palette is very intense and the white bristles are quickly stained. If you use natural hair brushes, my advise if not to use this Daiso cleaner as a primary brush cleaner, because it can dry your brushes out and spoil them. It is really, just too harsh for your delicate natural hair brushes. You paid a lot for your brushes and I’m sure you do not want this cleaner to spoil them. For me baby shampoo works so I will continue using it. For others, they prefer using a brush cleaner. Either way, don’t use this Daiso one as a primary cleaner. If you really wanted to get your brushes squeaky clean and looking pristine and new, you could perhaps, use this Daiso Detergent once in a blue moon to get the worst of the stains out. However, if you want to clean makeup sponges, this Daiso cleaner will do the trick impressively well. It is after all formulated to work to clean makeup sponges. Squeeze some Daiso Detergent into a container and dilute with water. I use 1 squirt of detergent in about 200ml of water because I personally find this product harsh. Mix it up and then dip your brushes into the water and swirl around until clean. For sponges, immerse sponges or puff into the water and squeeze until clean. PREVIOUS POST: Gong Xi Fa Cai! Happy Lunar New Year! Indeed! Its wonderful for sponges, and perhaps for those dense synthetic brushes but definitely learnt the hard way not to get it near my natural hair ones! EEK! You’re brave to test it out on natural bristles. Yeah, it should *never* be used for natural brushes. 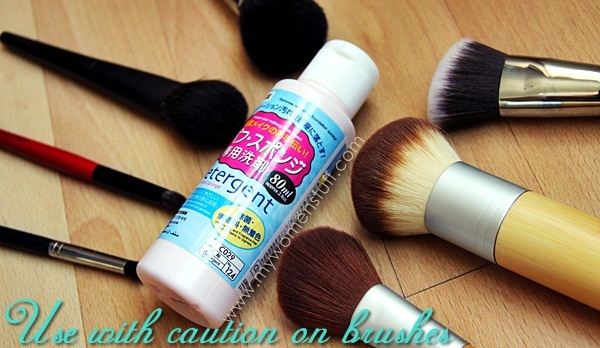 It’s popular in Japan but mostly for puffs, and definitely only for synthetic brushes like Shiseido 131. 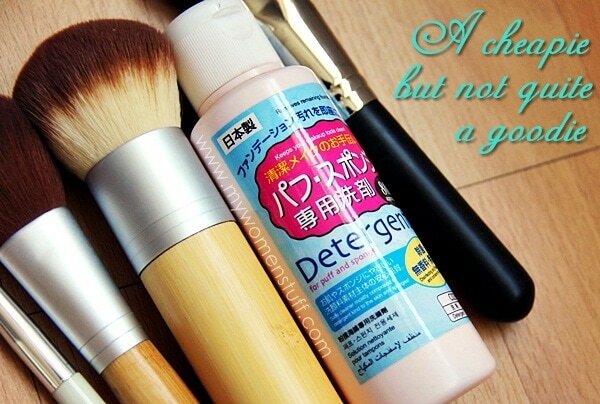 It’s also good for getting stubborn foundation stains off of clothing before laundry. My rule of thumb is, if I’m not going to wash my own hair with it (or if it’s not specifically a brush cleaner) don’t use it on the animal hair. Good to see you blogging, btw! 😀 Hope you have a good remainder of your holiday! Agree! Will only use something I use on myself for my brushes. Actually, I pretty much just use my shower stuff to clean sponges too. Not that I have a lot, just a couple, used randomly. So I don’t mind cleaning them with more expensive cleansers. I only use that to clean my sponges. Other than that, no way hosea man! That fact that its CHEAP and its from daiso, come on… N to use it on expensive brushes, my heart will bleed. Good thing you realized it earlier. I just cant imagine ppl actually raved abt it. I know some cheap stuffs are good but not all. Do not risk your expensive brushes ladies! I’ve only ever used it for my sponges, never my brushes. It’s too crazy good (and hence, would be too harsh la kan) so was afraid of using it with my brushes. Pariisssssssssss!!!!!!!!!!! Long time no see!!!!!! LOL!! Not that long, but felt ages! I’ve never tried this before… but I’m really kiasu with my brushes (since they are expensive) so I use more expensive brush cleansers if that makes any sense. I like Bobbi Brown’s for deep cleansing (went through 2 tubes of it), I sometimes even use my own conditioning shampoo to wash them, and I just discovered Barbara Hoffmann’s (recommended by a reader) which is pretty good so far. Jenn told me about the cleanser being rather harsh and I never use it for my brushes, synthetic or natural. even the sponges i am rather wary, usually if i wash them weekly or every other day the stains aren’t that difficult to get rid. but if it’s stained really badly, time to throw the sponges eh? Your #239 looks like that because it’s still wet right? Does it return to same shape when dry?? I’ve never heard of the Daiso detergent being good. I normally use the mildest shampoo I can find in the house, like Body Shop or organic one. But recently, I bought the Sephora Brush Cleaner, which is only around S$10. Really cheap considering I bought the MAC Brush Cleaner. So I’m using it. I definitely will not use a detergent to clean my brushes, no matter how cost-saving it is. Yep the brush looks a bit bedraggled because I’d just washed it for the camera 🙂 it fluffs back up when dry. This is an excellent question Cas! I’ll borrow it for a future post 😉 the proper way to dry makeup brushes is to lie them flat after patting dry on a towel and reshaping. Don’t dry them in the sun, but in a cool airy place away from direct sunlight. In our weather, brushes usually dry in a day, then fluff them back into shape and store as usual. a hairdryer may spoil the brushes although I can totally understand your frustration at brushes taking forever to dry! Think I’ll stick with my Bobbi Brown Brush Cleaner! I’ve used a few brush cleansers- Sephora’s, Barbara Hoffman, MAC and even Johnson & Johnson’s Baby Shampoo for my natural hair brushes (Lunasol and RMK), and find that MAC does the job the best, and second place goes to Johnson & Johnson. It removes colour and residue well (Because I mainly use them for foundation, and my Burberry powder foundation contains silicones which can make the brushes look raggedy and limp like a wet brush after a while), but the plus point of MAC for me is that it dries fast, and the con of Johnson & Johnson is the lingering smell. As for synthetic brushes (Sephora), I find that all perform quite well except for Sephora. I find that this is the only thing that will get my concealer brushes clean. And you are right, this is DA BOMB for sponges and puffs. The first time I went to Daiso, the first thing I picked up was the sponge detergent due to all the raves. After the first of using it, I was a complete convert. Ooooo. My kabuki brush needs cleaning. Do you know whether the one frm Loving minerals is synthetic? Wow thanks for this review! I almost–ALMOST–got the Daiso detergent due to lots of rave reviews. And being a makeup newbie, I only follow what other people do, lol. And all my brushes are natural so I would have panicked. I was planning to buy it tomorrow so reading this post is perfect timing! I guess I’ll have to try J&J then or any natural alternative, if I can find one that actually works.